Mushroom Trail Chefs at our local restaurants are busy preparing delicious mushroom cuisine. Recipes were submitted by Quadra Islanders. Each Chef selected recipe/s to offer on their menu during the weekends of: Oct 26 – 27 and Nov 2 – 3. Follow the Mushroom Trail, taste the mushroom delights! Plus – at that time you can place your name in a draw for a prize. Participating restaurants are : HBI, Cafe Aroma, Gowlland Harbour Resort & Kameleon. Barry Hodgson (Chanterelle Soup) served @ Gowlland Resort. Smokey Dymny (Mushroom Burger) served @ Kameleon. 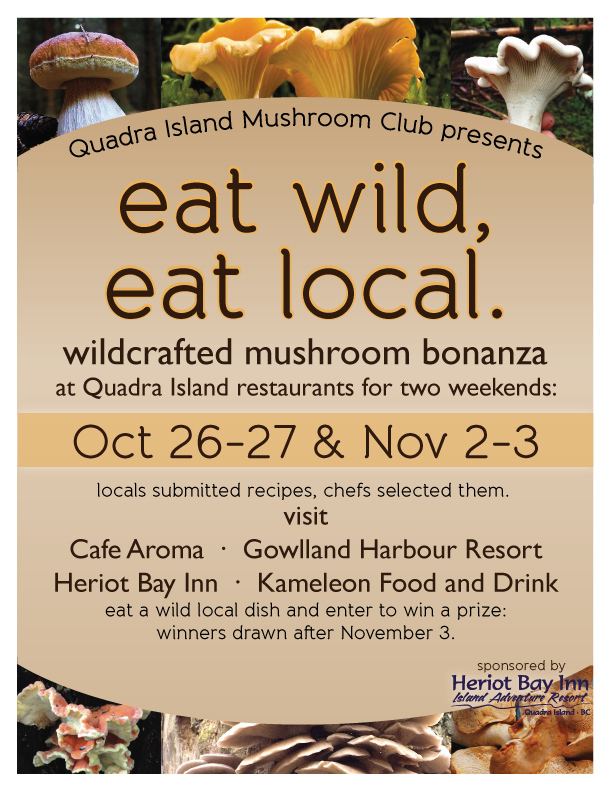 The Mushroom Club will be sponsoring Local Wild Mushroom Delights at Quadra restaurants during the weekends of October 26-27 & November 2-3. Quadra Islanders are sharing their favourite wild mushroom recipes with a number of the restaurants on the island. The Chefs will choose a recipe and present it on their menu. There are prizes to be won for the recipe winners, plus a draw will be made after the weekend of November 2nd for guests who purchased a wild mushroom meal at one of the restaurants. Take time to taste these delights and give us your feedback.